The idea for glow-in-the-dark ramen came to Ami Sueki in a dream. Four months earlier, she had founded her avant-garde design studio Zoo as Zoo, and her mind was constantly racing with new ideas and weird projects she and her team might bring to life. But no concept was quite like the one that came to her in the dead of night. 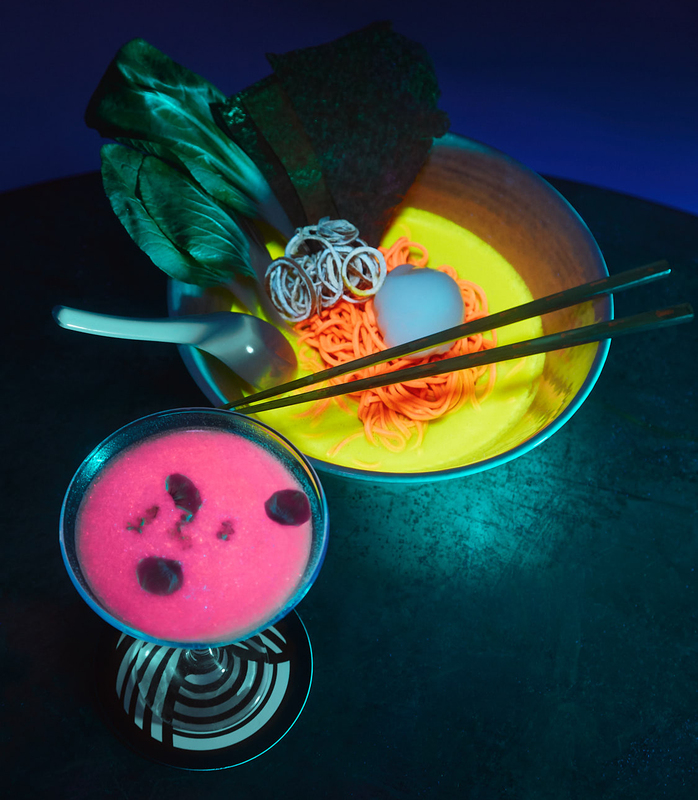 She reached out to an acquaintance at London’s Bompas and Parr—a culinary events studio staffed with food artists-slash-mad scientists who once created a temporary nightclub with inhalable cocktails—to explore the possibilities. A year after the dream, Sueki—a former industrial designer for Coca-Cola who before that studied neurobiology at Duke—happened to recount it over lunch (serendipitously, at a noodle house) with Courtney Hammond. Hammond is co-founder of Atlanta-based creative agency Dashboard, which has pulled off such feats as transforming the six-acre Oakland Cemetery into a multi-discipline art installation and locking two artists inside a vacant former nightclub for three weeks. Hammond was immediately hooked on Sueki’s vision, despite the fact that neither of them knew how they might pull it off (or pay for it). Two years after that lunch meeting and three years after Sueki’s late-night epiphany, Nakamura.ke—a tiny, freestanding, pop-up-restaurant-meets-theater where everything edible will glow and every aspect of the experience is steeped in story—has materialized on Edgewood Avenue for its international debut. It is quite possibly the strangest experiential dining concept Atlanta has seen, right up there with ARTXFOOD, a Hollywood pop-up that takes place inside a cube filled with art, or New York’s “How Do You Hug a Tiger,” an autobiographical storytelling-turned-dinner experience. At Nakamura.ke, which runs from January 30 to February 16 (tickets are sold out), guests get dinner and drinks against a fantastical backdrop populated by mythical spirit creatures. A night at Nakamura.ke includes guests from the underworld sharing tales of their travels, luminous shochu and sake cocktails—and, yes, glow-in-the-dark ramen. The most pressing order of business in launching Nakamura.ke was figuring out how to safely and deliciously make food that glows. 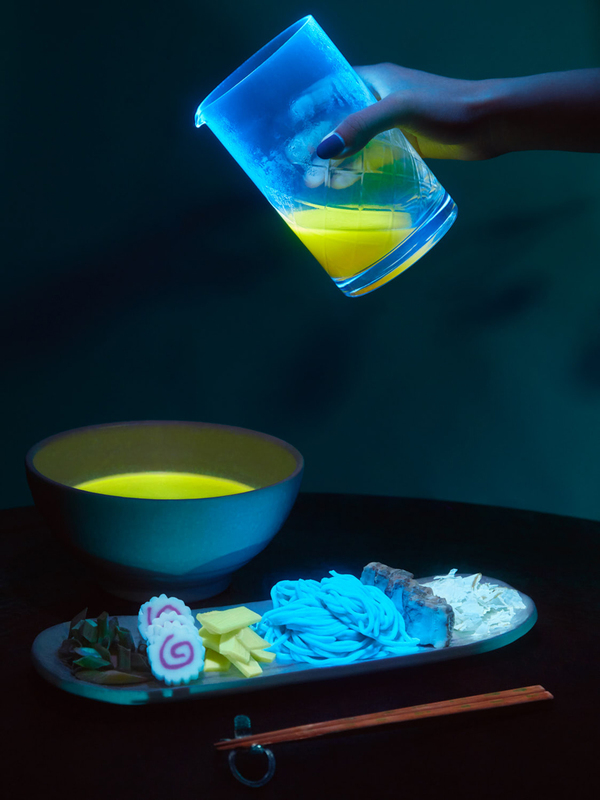 The inventors at Bompas and Parr have studied luminescence and its culinary applications for more than a decade, debuting it publicly at a 2009 installation at the San Francisco Museum of Modern Art. In that instance, they infused jelly with quinine, which is derived from tree bark and found in tonic water—and glows under black light. Applying that technique to ramen, the firm’s cofounder Sam Bompas explains, was simply a matter of tinkering with quinine levels and natural food coloring, taking into account how the delicate balance of both would stand up to ramen’s high temperature. 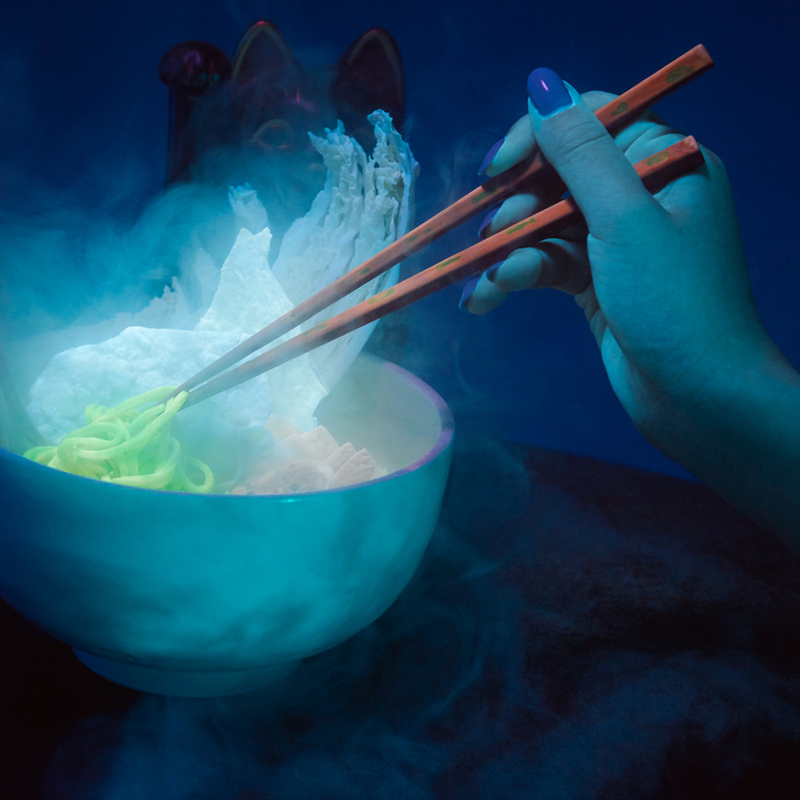 After three weeks in the lab, the inventors were able to craft a glowing bowl of noodles that, despite its radioactive-looking appearance, is safely made with all-natural ingredients. Nakamura.ke is housed in an intimate space, inside a freestanding structure that takes up two parking spaces and only seats six people at a time. Seatings adhere to a strict 30-minute limit—a concept inspired by Tokyo’s tiny, hyper-efficient ramen shops, and also designed for the logistics of the theatrical component. For those who don’t snag the $75 tickets, or who want to stay in the underworld a little bit longer, Space2 next to the Sound Table, on the corner of Edgewood and Boulevard, will serve as “the Nakamuras’ living room,” Hammond says, complete with a la carte glow-in-the-dark offerings (including cocktails and dumplings) and a lineup of DJs curated by Sound Table co-owner Karl Injex.